The GE WPDH8800JMV is an innovative front loading washer packaged in a simply yet attractive design that comes with various features to tempt most homeowners. Its ENERGY STAR qualificiations makes it an excellent candidate for today's time, with different spin and wash features for a more convenient and high quality clean to your clothes and fabrics. The washer cycles include Active Wear, PreWash, Quick Rinse, Stains Inspector, Speed Wash, and 2nd Rinse. The unit comes with a Fabric Softener, Dispenser Detergent Timed Flow-Thru, Bleach Timed Flow Thru, and pretreat functions. It comes with five wash or rinse temperature options including sanitize. It allows for a delay start of up to 24 hours. It allows for color cycles. The control type is electronic. It comes with the SmartDispense technology for easy detergent dispersal. The End of cycle signal us available for added convenience to users. It has a maximum speed of 1,300 RPM. The SteamAssist feature makes it easier to get rid of hard to remove stains. It features the Luxury Quiet Package, allowing users to wash clothes without noise disturbance. It features the H2ition Wash System, which senses the size of load and accommodates water and temperature amounts that would work best. It comes with Child Lock for added safety. The Vermillion Red color make it a great complement to the contemporary kitchen decorations. It features a see through for convenience. The door handle is TrueGrip for style and a firm grip. Installation may be stacked, on pedestal, or side by side. It features different wash cycles for greater versatility. 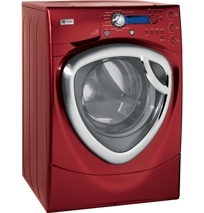 It features ENERGY STAR capabilities for a more economic way of washing clothes. The delay start up can be programmed for up to 24 hours for an easier and automatic wash everyday. SteamAssist ensures that the clothes are thoroughly penetrated to remove even the toughest stains. The Child Lock makes it ideal to use even with children in the house. The SmartDispense technology allows for six months of detergent storage in its space and automatically injects detergent when needed. The color options makes it a stylish device to have around the house. The end of cycle signal makes it very handy especially if you are multitasking. The huge washing capacity makes it great for large homes or for washing bed sheets or curtains. It can occupy a large amount of space. Some users have encountered hardware problems during initial installation. Leaks or water problems surfaced at initial use. looks great in the house.